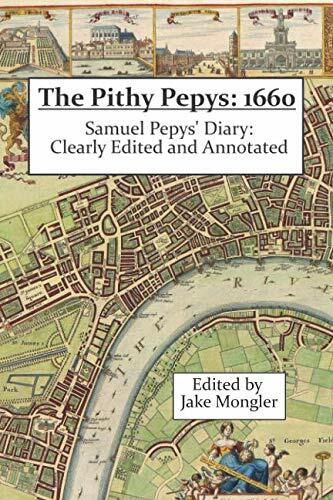 The Pithy Pepys: 1660 is a new book that edits and annotates the 1660 entries of Samuel Pepys’ diary. This book’s goal is to strike a balance between improving the clarity and forcefulness of Pepys’ writing while still having his unique voice shine through. This balance means the prose in this edition isn’t so much modern but modernized. Where words and phrases were replaced, the book uses language that existed in Pepys’ day but that’s more understandable to a present-day audience. Additionally, it includes nearly 400 annotations to provide background and illuminate the scenes. I slept late because I was extremely bothered overnight by the barking of one of our neighbours’ dogs. Then in the morning, I took medicine* and stayed in all day. * Pepys used the archaic word “physic” here and may have specifically meant a laxative. The 17th-century diet was low in fiber and high in meat and alcohol which made laxative use common. The book also removes the Victorian-era censoring found in the public domain versions of the Diary. So now you can experience the full glory of Pepys stepping “into a great heap of turds, by which I find that Mr. Turner’s latrine is full and overflows into my cellar” on October 20th, along with other memorable passages. All in all, the book is kind of like the distilled wisdom of this site’s 1660 entries and annotations. It sounds like quite an effort to undertake, so congratulations to Jake on putting this together!